The kalo is ready to be harvested. And that’s cause for a celebration. Students, faculty and the public are invited enjoy an action-packed event that features poi pounding and food at the third annual Ka Māla o Niuhelewai, or the Garden of Niuhelewai, on Wednesday, April 16, from 10:30 a.m. to 1 p.m.
Every April the campus celebrates the māla and this year’s event will include poi pounding activities, food prepared in an ‘imu and Hawaiian music. 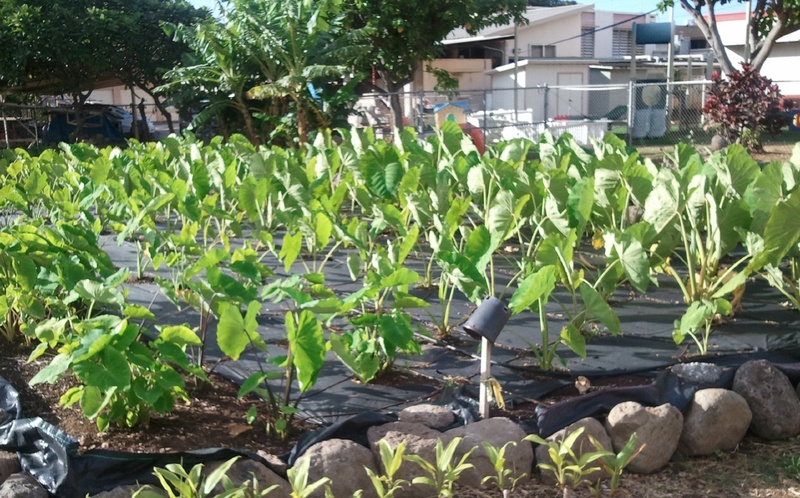 Ka Māla o Niuhelewai has been an instrumental hands-on venue for students, faculty, staff, and the community in supporting the Hawaiian understanding of sustainable mālama ‘āina application for producing food for Hawai’i,” said Hawaiian Studies instructor Mark Alapaki Luke. In 2012, Ka Māla o Niuhelewai received the Scenic Hawai’i Betty Crocker Landscape Award. It was also awarded the Honolulu Community College Sustainability Award at the 2014 Hawai’i Sustainability in Higher Education Summit.